In the recently concluded UPSC civil Services Examination 2018, more than 100 toppers were subscribers of our Prelims Test Series 2018. Their testimonials (check screenshots below)about the quality of our tests and significant contribution made by our well planned timetable in disciplining their preparation have again proven – year after year – why every serious IAS aspirant must go for InsightsIAS Prelims Test Series. Also, as one of our toppers in the below screenshot has mentioned, you need to follow the timetable BLINDLY. If it has worked for hundreds of toppers, it will work for you too. You just have to start from the beginning to notice how much huge difference it is going to make to your exam preparation in a positive way. 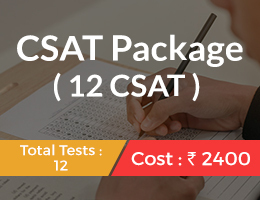 This year we are launching TWO test series keeping in mind TWO broad category of students who are preparing for UPSC civil services exam. One category of aspirants are Freshers who haven’t taken any coaching yet but want to start preparation either in college or from home. Another category of aspirants is one who have completed either coaching or have finished basics on their own. This category also includes aspirants who have given attempts in civil services exam. Both category aspirants need absolute discipline in their preparation if you have to clear prelims, or the all stages of this exam. Our timetables, which are so carefully prepared after consulting hundreds of aspirants across the country (through their valuable feedback), will provide you a roadmap to both simplify and bring discipline in your exam preparation. Freshers need to complete basic books first. Hence one of these two test series provides you a timetable that focuses on TEXTBOOKS first. First 11 tests will be based on NCERT books (NEW ones). Later tests will be based on STANDARD texts. In the final leg you will get full length tests (this year we have increased their numbers to give you extra practice). In between there will be revision tests too. Your preparation will start from very basics and will end up with multiple revisions. 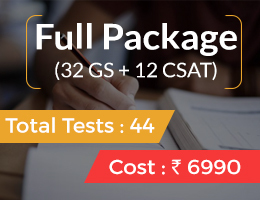 Ultimately, as our toppers have told us (you), this test series will EMPOWER and ENABLE you to clear the first hurdle of this exam with confidence. Be aware that Prelims is getting tougher. Buying tests from photocopy shop in the end and trying to memorise facts will DEFINITELY ruin your attempt. 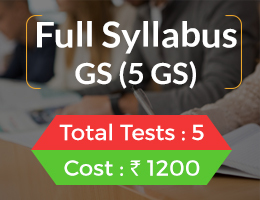 What you need is GENERAL AWARENESS that you can get only by studying standard texts and applying the gained knowledge in a test like situation repeatedly – which our test series platform gives you in a very user friendly way. In addition, we will be giving you 10 mains questions with every test along with synopsis. This is to help you study these texts not only from prelims point of view, but also from mains point of view. These are practice questions for you to write answers at home. Even when you join coaching, joining this test series helps you complete standard texts aligning with the coaching schedule. Most coaching institutions don’t let you read standard texts. Neither they give enough tests from beginning. It’s better to be smart and have an integrated approach from the beginning. This saves many years of your youth. You may read our last year post on test series to understand how and why you should use Insights test series. We have designed test series SUBJECT-WISE or Module – wise. The timetable has kept in mind the integrated nature of preparation (prelims + mains) that is required to ace this exam within one or two attempts. 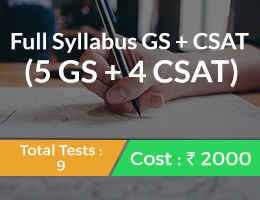 This test series is designed in such a way that it helps you not only make notes for all topics systematically, but will also help you revise three times entire syllabus by March 2020. 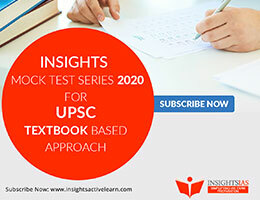 Keeping in mind diverse set of aspirants within this category – such as those who have finished coaching, those who have written Mains, those who are skipping 2019 attempt to focus on 2020 attempt – this test series is designed to give you enough time to study every nook and corner of UPSC civil services prelims and Mains General studies syllabus. When you are planning for 2020 attempt, you must take care to not to waste time. Aspirants tend to waste lots of time when they think that they have lots of months with them. Joining our test series makes sure that you won’t waste your time. Why you MUST join InsightsIAS test series? The screenshots in the beginning of this post might have already convinced you. But then, based on our experience of interacting with thousands of students, we must tell you why you should not think twice to join our test series. As explained above our test series will definitely gives direction and discipline. In addition, this gives you much needed seriousness and confidence. To clear this exam you need more confidence. This confidence comes through systematic completion of syllabus and showing gradual improvement in retention of information. And then applying this knowledge to score better in tests. Without confidence, you can not clear this exam. Imagine this: You may decide to buy pirated copies of tests from photocopy shop and solve them once you complete all books. In reality, you will not solve these tests. Firstly because you haven’t invested much, secondly you tend to postpone because you don’t feel the competition. In our test series, you will be competing with thousands of serious students across the country (we had 15000+ subscribers last year). The ranking you get gives you a clear picture about where you stand compared to your co-aspirants. Moreover, section-wsie analysis of performance in each test helps you work more on your weak areas. We have a team that carefully researches and frames questions in order to match UPSC standards and meet aspirant’s expectations. We are very sure that those who have seriously given or giving 2019 tests will clear Prelims 2019. As we are fond of saying – InsightsIAS tests truly EMPOWER aspirants to be the best they could be to beat their competitors. There is another strong reason why you must subscribe. That is – your encouragement helps us keep this website (www.insightsonindia.com) running free of cost. A small investment from your side can have significant impact on your result. With this timetable you don’t have to plan by yourself and can save hundreds of hours. Completion of syllabus is a must to succeed in this exam. Our test series will help you here very much. NOTE: We have kept May 24, 2020 for the last test. 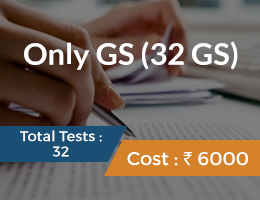 If UPSC decides to conduct preliminary exam in the third week of May 2020, we will pre-pone the test date. This test series is mainly meant for those who have finished basic reading at least one. 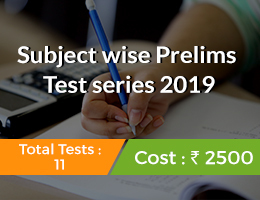 Tests under this test series will be Subject – wise and will help you complete both prelims and mains syllabus before February 2020. This test series has 37 Tests. Out of 37 Tests, 25 tests are subject-wise and full length (100 Questions). There are 13 Full Length tests to give you extra edge over others. A detailed timetable with sub-topics for you to prepare notes comprehensively. Once you subscribe, what you should be doing till the first test? Assuming you are fresher, choose Optional subject immediately. Choose it wisely. Once chosen, finish as much as possible during next two months. Don’t waste time gathering opinion here and there. Once you subscribe, impose full faith and follow the timetable BLINDLY. Success will be yours. Don’t think about Pricing too much. If you think you have paid (or paying) good amount, extract maximum from the test series. Do justice to the price you have paid. From our end, we will 100 percent do justice to the price you have paid. We promise. You will not regret. We know we make mistakes. But we learn and improve every time. Wish you all the best. May your journey be smooth and enjoyable. NOTE: Subscription for Offline Prelims Test Series will be enabled from next week.